Many in the green industry consider the Serbian Spruce the most beautiful ornamental spruce, period. (Rick’s note: I have one in my own front yard, and I agree wholeheartedly). 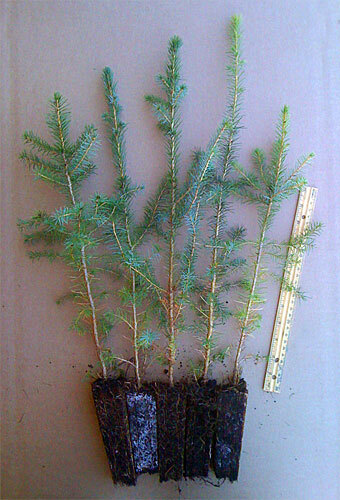 Serbian Spruce plug transplants for sale feature short, dark green, flat needles (similar to a Hemlock) with a breeze revealing lovely silver undersides. Serbian Spruce plug transplants at maturity feature beautiful purple seed cones and a visually pleasing overall conical shape. Serbian Spruce plug transplants are fast-growing, do well in full sun, and reach a height of up to 60 feet with a spread of 20 feet or more at the base. They prefer richer soils, but can do well in sandier soils if watered two to three times per week. Few natural pests or diseases affect Serbians other than White Pine Weevil, which, if discovered, is easily controlled with over the counter pesticides.